Powerpoint has made visual presentations well within the reach of everyone and, as long as you stay focused on the concept of a visual presentation, rather than your notes on the screen, they can be very persuasive. However, when you’re travelling to give a presentation in someone else’s office or facilities it can be challenging to get your presentation off your equipment onto their screen. You need lots of paraphernalia – wires, connectors, powerpoints and, of course, a projector. Lugging a small suitcase full of kit isn’t always ideal. With today’s smart technology you may not need any of this kit though. Your tablet or laptop and a tiny bit of hardware (about the size of a USB stick) and you could be ready to present in seconds – wirelessly. All that is required is a flatscreen TV with a HDMI port (the same connection you would plug in a DVD/Blu-ray player or SkyBox). The WiFi connection becomes your ‘cable’ and pushes the display on your tablet or laptop to the big screen. What is this magical piece of hardware? 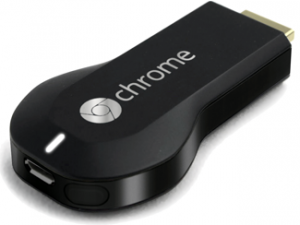 ChromeCast – the offering from Google and, at just £30*, the lowest in cost. AppleTV – for Mac users and, as with most Mac products, a bit more expensive at £79. IOGEAR Wireless Mobile device – even more expensive at around £135. These clever little gadgets allow you to stream video, PowerPoint presentations and show diagrams and other images to help you get your message across. It’s a great way to show training videos, footage of situations you want to discuss with colleagues or recordings of presentations for analysis. You can even use it for watching Netflix (and can subscribe using this gadget) or videos stored on your computer; although you might not want to let the boss catch you watching Game of Thrones in the conference room!